So this is my second bit of news - yes I have been asked to be a Visiting Artist for a second time at Gingersnap Creations. How amazing is that? This is the last month of challenges as both Ali and Shar are off to do different things and as you know Shar is starting Unruly PaperArts and I am going to be one of the Columnists, so there's a great link for me. 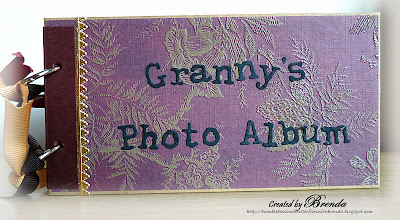 So the theme at Gingersnaps this week is 'Granny's Photo Album' and I have taken this title literally. 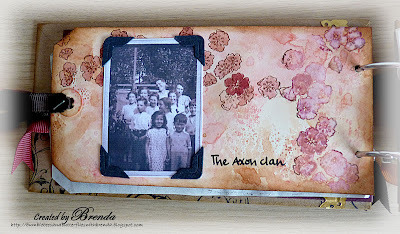 I have made a tag book and included photos of my Mum and her family circa 1930 - 1940. My Mum probably about aged 16. 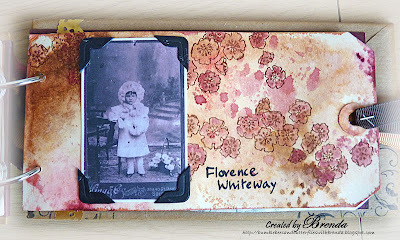 The tag backgrounds were done with the wrinkle free distress technique then stamped with the flowers and I used the same DIs to just lightly paint them in which has given them more form. In-between I cut tags using baking parchment and used a flourish stamp with Stazon and a small one with Flitter glue and gilding flakes. Mum was fifth out of seven children. Here she is at the front with brothers, sisters and cousins. My Mum's Mum - My Granny. 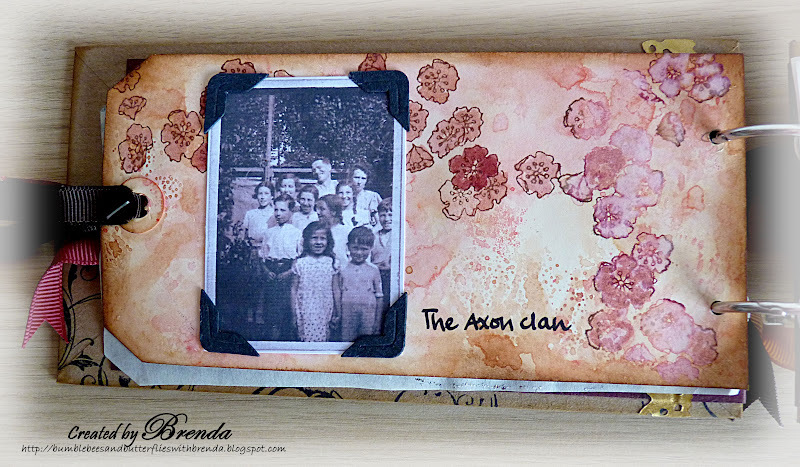 I loved making this - book making is what I have been doing the longest, and it was great to include old family photos. 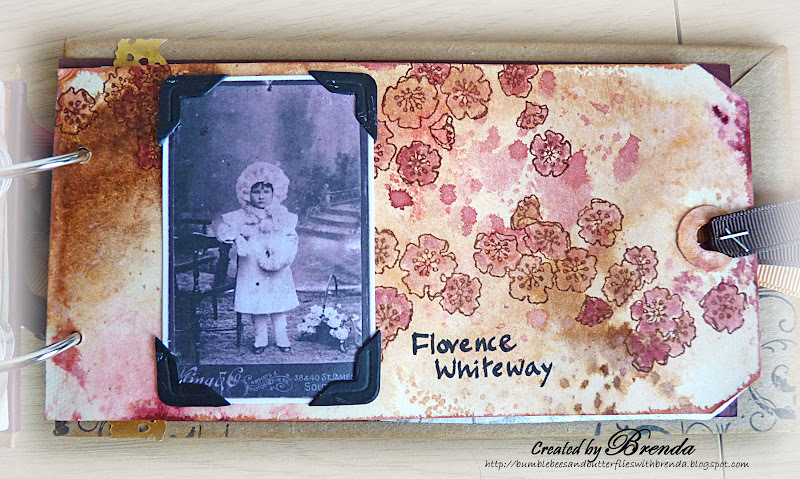 Have fun with your vintage project and photo album theme. You are having an awesome year Brenda! Congratulations on being featured...on your new writers spot...and on a wonderful tag album. This is beautiful Brenda. This is a very special project and I am sure it was beautiful to sit and create with those photographs. Super duper project from you again, Brenda - no more that we've come to expect! Love the pix. Congratulations on your new job as columnist - ENJOY! Beautiful book! Love the cover and the way you've kept the photos the focal point. Another round of congratulations! WooHoo! Using family photos makes this little album extra special! The tag pages are beautiful and how clever! Loving this! Hugs! What a fantastic mini album , its lovely. Congrats on the visiting artist spot. This is a fabulous tag album, and beautiful photos. A real treaure. Congrats on being a visiting artist again :) Your album looks fantastic. A wonderful memory album. Congrats on your GDT spot. Brenda, this is a wonderful book, such sweet layouts, and so many delightful details. Thank you for sharing your special photos, too! Such a fun tag book!!! Love that you included family photos. Oh this is so beautiful Brenda.